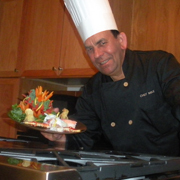 Our award winning Executive Chef, Michael Abul Hawa, with decades of creative inspiration, has prepared amazing dishes for presidents and kings, celebrities, profitable fundraisers, and corporate affairs that have proved to be legendary. Each wedding, surprise party, intimate family gathering, grand opening or any other occasion unveils his ability to customize each dish to your desires. With his vast experience in cooking authentically in twelve different cuisines, his extensive training in Jerusalem, and expertise working with the finest chefs in the area, he excels at each and every turn. Running a creative kitchen is always a challenge. Our chef is constantly finding new, healthy ways to tempt your taste buds, and the kitchen staff contribute their ideas, as well. 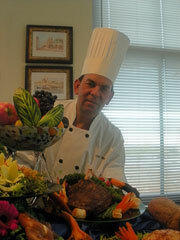 The results are always welcome, resulting in all the ingredients necessary to bring your party to life. We use the freshest of nature's bounty and have an inspiring collection of recipes for you.